May 18th will be a beaver day for Camp Bomazeen. 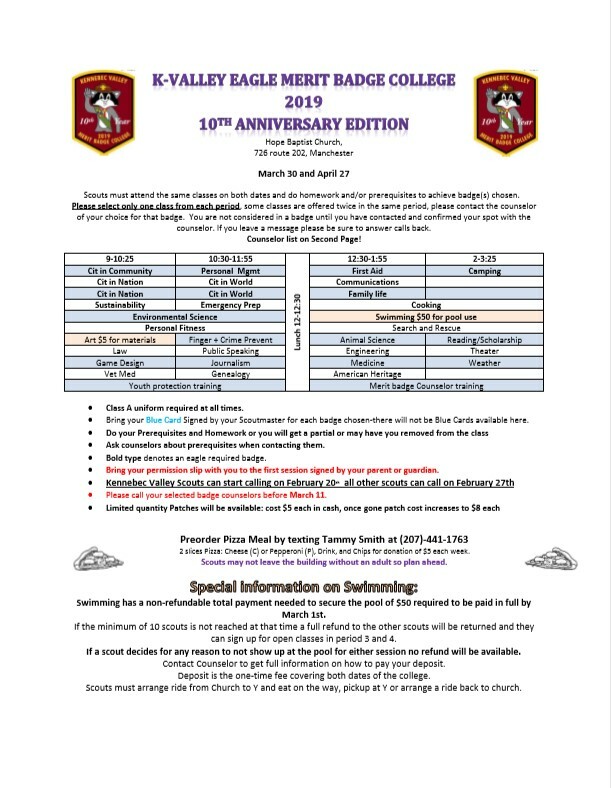 The camporee will be open to Packs, Troops, Crews, Posts, and Ships. 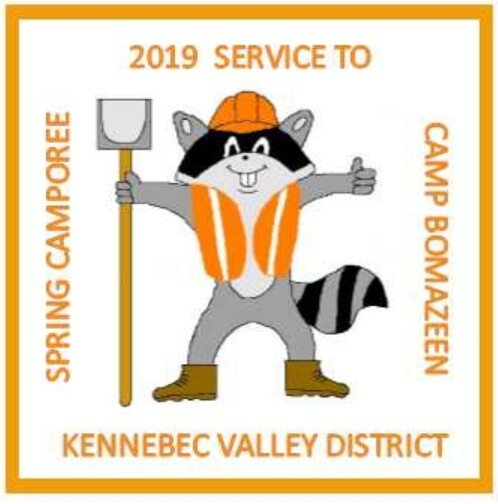 This will be a service to camp camporee, but there will still be fun activities for the Units. There will also be an IOLS class held at the camporee. -Animal Science - Mr Hurlburt The badge covers the basics of farm animal biology; including care, feeding and health. We will discuss the slaughter and butchering of meat animals. Please read through the requirements before signing up for this badge. There will be a LOT of independent work outside of class. Prerequisites: #1 and #2 Art - Mrs Scorza Art is all around us and is used for many different reasons. Spend time looking at different types of art and create some of your own! Prerequisite: A $2.50 charge for supplies will be collected at the first class. -Citizenship in Community – Mr Daigneault A nation is a patchwork of communities that differ from each other and may be governed differently. But regardless of how local communities differ, they all have one point in common: In the United States, local government means self-government. Good citizens help to make decisions about their community through their elected local officials. Prerequisites: #2, #3, #4, They must bring a copy of the merit badge workbook Citizenship in Nation – Mrs Batson What does it mean to be American? We are fortunate to live in a nation that gives us so many freedoms. This class will discuss what Citizenship in the nation mean. What are our rights as well as our responsibilities and how does being a citizen in the nation connect us with others in the world as well. Prerequisites: Do #3 and #8. Review the MB Book and be prepared to discuss all in class. -Citizenship in Nation – Mr Jackson Gain an understanding of this nation's founding documents and your rights and responsibilities as a citizen. Prerequisite: Be prepared to discuss 1, 4, 5, 7 and 8. Choose a speech to cover so it can be approved for #6, and bring a copy of the letter to your senator or representative for #8. -Citizenship in World – Mrs Connolly Scouts who complete this merit badge will discover their role in the world community and how to navigate the differences between governments and how international law works. Prerequisites: #7. -Citizenship in World – Mrs Batson We all live in this world. Because of this, we are not only citizens of the United States, but we are also citizens of the world. This class will discuss how living in the world makes us citizens that connect us not only to people in the United States, but to the world as well. Prerequisites: # 3 and #7. Please review the MB Book and be prepared to discuss it. -Communication – Mrs Connolly Communication is so much more taking and many say it’s becoming a lost art. Come find out how Communication enhances your life and the opportunities. Prerequisites: 5 & 6 prepare your plan proposal & 8 develop the plan and make arrangements to serve as MC. -Cooking - Mrs Selwood Cooking Merit Badge Teaches the principles as it applies to indoor and outdoor cooking, food safety nutrition, meal planning cooking careers, and food preparation. When cooking outdoors it also teaches the principles of Leave No Trace. Prerequisites: #4 Prepare keeping in mind (allergies) or special needs. How you kept foods safe and free from cross contamination. 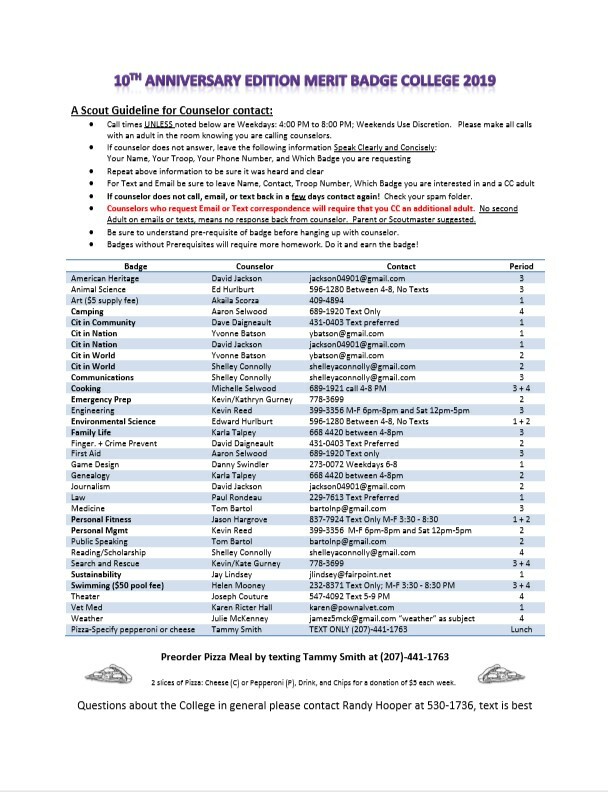 List the equipment and utensils needed to prepare and serve these meals. -Emergency Preparedness – Mr and Mrs Gurney Are you prepared for a hurricane, blizzard, zombie apocalypse, or other disaster? Emergency Preparedness Merit Badge will give you the knowledge that you need to be prepared to help yourself, your family, and community in the event of a disaster. Prerequisites: Completion of First Aid Merit Badge (bring documentation with you to first class). Before class: read the MB pamphlet and be ready to discuss the information. -Family Life – Mrs Talpey The family is the basic unit of society and is important to both individuals and communities. The world is rapidly changing, making today's society much more complex than ever before. As Scouts earn this merit badge, they will realize why it is important to know more about family life and how to strengthen their families. Prerequisites: Scouts can preprint the Worksheet and start their home chores once they have registered with the MBC. AGE PREREQUISITE: Scout must be at minimum 14 years old to take this Class. It is also recommended that they be a 1st Class scout or higher rank. -Game Design - Mr Swindler During the game design merit badge course you will analyze several different kinds of games as well as design, prototype and test your very own game. Prerequisite: Analyze four games you have played, each from a different medium. Identify the medium, player format, objectives, rules, resources, and theme (if relevant). Be prepared to discuss, at our first session, the play experience, what you enjoy in each game, and what you dislike. -Genealogy - Mrs Talpey Where do we come from? Where are your parents, grandparents from? Learn how to explore your family's roots and history in this class. Build your family tree starting with you and moving backward through time. -Journalism - Mr Jackson What is "fake news?” Are journalists really biased? What is journalism and how can we tell who is telling the truth? Come join us while we explore careers in journalism. Prerequisite: 1, 5, and be ready to decide if you will focus on written or TV journalism. -Law – Mr Rondeau This study of Law begins with the genesis of law, explore its various components, and how it operates in contemporary society. Prerequisites: None. Be prepared to discuss requirements 1, 2, and 3 at the first session. -Personal Fitness– Mr Hargrove Come learn about the signs of good health, your current fitness level, and develop a fitness plan to help you achieve your fitness goals. We will also discuss warning signs of poor health and the impact of good nutrition, among other things. Prerequisites: Current BSA Physical Exam. Statement from your dentist of a current dental exam; teeth have been checked and cared for. -Search and Rescue - Mr and Mrs Gurney What would you do if someone you know became lost? Not sure? Search and Rescue MB will give you the knowledge that you need to safely assist 8in the search. Prerequisites: Read the MB Pamphlet. Find out who has the authority in your area for Search and Rescue, What are their responsibilities? Be prepared to discuss this in the first class. . Sustainability – Mr Lindsey Preserving our environment, Recycling, self restrictions, growing your own food, supporting the world ecosystems are all part of Sustaining our world. Come learn your role in helping yourself, family, friends, peers and the neighbors you never met. Prerequisites: Contact counselor before starting anything on this badge. -Swimming- Mrs Mooney Swimming Merit badge is an Eagle requirement. In this class we will be learning safe swim defense and learning ways to do a water rescues. Prerequisites: your health forms, this is part of safe swim. Swimming is a great exercise for life. OFF-SITE Location: KVYMCA at 31 Union Street Augusta ME. 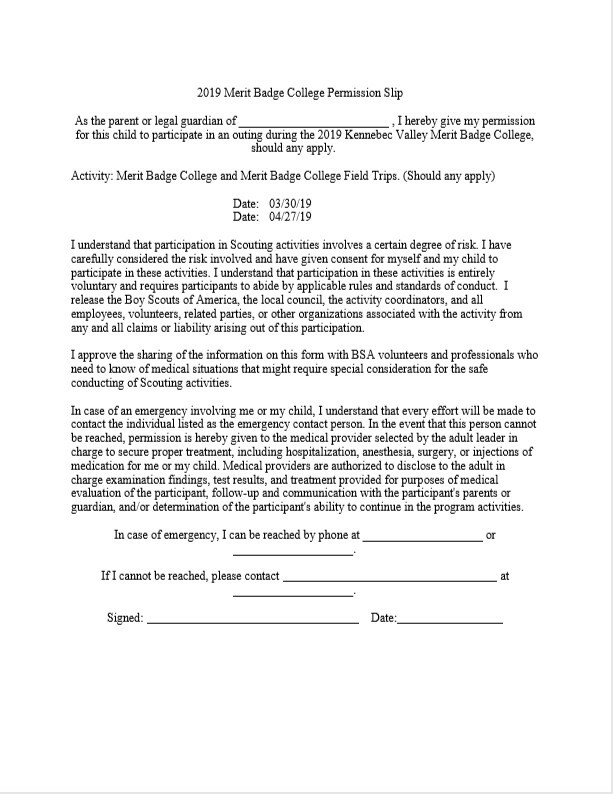 MB College Permission slips must be signed by parent! -Theater - Mr Couture For this merit badge, you will read three full-length plays. Together we will discuss the plots and you will then write a concise review. The hope is also to attend a local play in between the sessions. Included also in this, after reading and reflection, we will have open discussions on the acting and the staging of each performance. A more difficult requirement is in writing a mini one-act play that will take at least eight minutes to perform. The play must have a main character, conflict, and a climax. Your counselor(s) will help you in this task, if need be. When you sign-up, please inform the counselor of any plays you would like to read. -Weather - Mrs McKenney A look at weathers cause and effects and how they pertain to our everyday activities. Prerequisites: Merit Badge workbook, 2018 updated version. Pamphlets are optional, but helpful. They should look over the merit badge requirements. They also need to have their cyber chip so they can do online research. Dress warm for outside.